I am still loving my Reliable orange iron that I received for my orange sewing studio a few years ago. Really. Ironing is a necessary evil, especially if you sew, it might as well be pretty, no?! And it works really well, too, which just makes it that much better ;) Never spits or leaks, which is more than I can say for my children. I get to give away TWO irons! Yes!! Even if your iron works just fine, you want this one. Because it's cute. Enter by leaving a comment (with your email address if it's not linked to your profile) and I'll announce winners on Monday! Great color! My iron is not that pretty, for sure. Yes, that is very cute! Oh, it is very cute! I would love a pretty iron because you are right, ironing is a necessary evil! I feel like an iron that cute might whistle at me while I work, like the Brad Pitt of irons...if BP would ever whistle at me, which is doubtful. But, you know what I mean. Nice iron. I don't have an iron! :o) Could really come in handy when I no longer have roommates to share with me! Oh, I want a new iron! Please! Happy birthday! Wow an iron for my sewing room would be amazing! Also, I have a 4 month old so I feel you with the spitting and leaking!!! i would love this! yes, please. and look at cute rolly-polly you! Why not make chores more cheerful by adding some fun color! My old iron just took a dive off the ironing board so a new iron is in order. Happy birthday! I would love an orange iron! Happy Birthday. I would love a new working iron. Old trusty has been a little rusty on the heat settings. Then new fancy pants fell of her high perch and now looks a little like humpty dumpty. Oh - I would LOVE one! Mine is so boring and only works so so. I am all up for a new iron. And is it just me or does the girl to the very right (the tallest - your sister?) totally look like Pearl in that photo?? I'd love a new, good iron :) Mine leaks all over and spits too! Awesome! Really do need one of these since mine doesn't steam AT ALL! I need a new iron! Mine is leaking water. :( I hope I win! And mine is dying... Happy Birthday, Katy! This would be awesome! Mine just started spitting and leaking and badly needs to be replaced! I love my ancient-by-today's-standards iron, but could always use another. Happy birthday Katy! Hope you have an awesome day!!! Love to win the iron...ooohhh, orange! A new iron would be a dream come true! That iron is AWESOME! Love the orange... It would look so pretty with my ironing board cover! P.S. 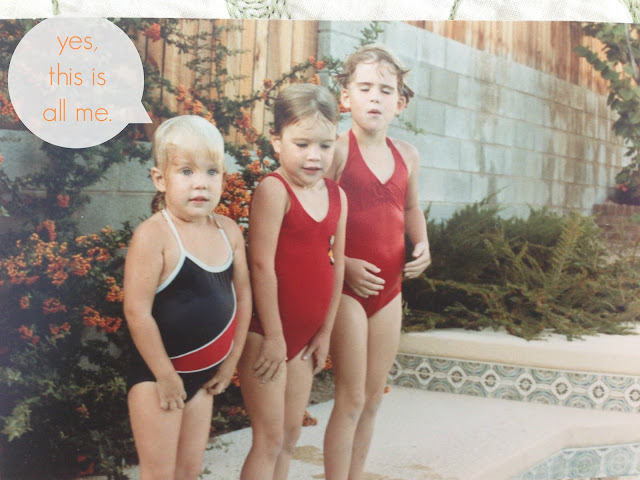 I had the swimsuit as you! Total flashback! Ha, I only have an iron to sew! I'm always sending hubby to work all wrinkled, it's not for ironing is for pressing right! This is super cute. hope i can win one of those...just one would be great! I could use a new iron!!! Yippee!!!! I am definitely in need of a new iron, and orange always makes things better. Mine is at least a dozen years old and is fighting to hang on. I could really use a new one, AND orange is my favorite color too. I really hope I win this one. I need a new iron...plus this one is cute....it's perfect! Oh gosh! Just in time! I needed a new iron! It's so cute and bright! Happy birthday and thanks for a great giveaway. Who doesn't need an orange iron? Happy Birthday!! my iron recently died and it's replacement is awful -- doesn't steam for ages then spits all over me. thanks for the chance! Would love a new iron!!! Totally need one Oh happy day!!! happy birthday to you! that's a fun giveaway right there! thanks! Oh, I would love a new iron! Especially such a pretty orange one! A cute orange iron would definitely make the job more fun! I hope you get at least as many gifts as you are giving to us! Happy day, and many thanks! I would love an iron that does not leak! What a novelty!! Yes! I happen to be in need of a good iron! My iron spits and leaks all over the place. (My kids do too.) So of course I would love the chance to get a new fully functional and ATTRACTIVE iron! Thanks for the chance! I would love a new iron especially an orange one. Mine has been dropped too many times to count! I could use a new one and love the colors! I desperately, desperately need a new iron! Mine leaks and spits like a camel or some other leaky/spitty animal. My iron leaks a lot after only one year of use! So no steam for me. Nice to hear yours doesn't leak!! I need a new iron! how fortuitous! my iron (that my grandma found for me at a yard sale when i started college) is starting to short out! that iron is WAY cuter than the one i'm using now!!! Ooh...my iron bit the dust and I'm borrowing my MIL's (which randomly leaks and spits eww). The orange really is beautiful! I just bought a new iron and I'm not loving it. This one would be great! Oh please count me in if you're willing to post to Australia. If not Happy Birthday and happy blogging. I love pretty things. And I'm one of those crazy people that finds ironing/pressing relaxing. Newly married and don't have an iron yet. How nice such a sunny, happy one would be! What? An iron? I should be ironing things? Honestly, who doesn't need a new iron? Oh that looks like a great iron - thank for the chance! Ironing just might be more fun...? I have an old school iron and would love a new school one! I would love love love a new iron!! Oh my goodness! I'm still sewing (and ironing) with the iron I was given 17 years ago before I went off to college. This would *surely* make a change! A new iron would be fabulous! I have the cheapest iron I could find! Love how cute this one is! OOOH! Me please! The iron we got for our wedding (cough...9 years ago) is on its last legs...and I am in dire need! Thanks for all the awesome giveaways today!! Happy B-day! Have you seen my iron? That's because I refuse to show anyone the piece of crap I'm working with. MEMEME! I'd love a new iron. I *sew* need a new iron! Mine is 19 years old... just haven't broke down and bought a new one! I spent way too much on what was supposed to be a nice iron last year for my sewing studio, and it both spits *and* leaks. This would be great! Love the iron...and I would love to win it! Happy Birthday! I have been thinking about this iron ever since you first posted about it. Oh how I would love to own an orange iron. It would make me smile when doing a dreaded chore I am sure! Thanks for the opportunity to win such a cool iron! I definitely need one of these lovelies in my life! I'm so tired of trying to track down our iron when I'm sewing and my husband has stolen it to press his shirts. Wait nevermind, should I be complaining that my husband does his own ironing?! That would be so wonderful! I have one of the most horrible irons in the world. And it's new. But terrible. then she said WOW this is a terrible iron. She couldn't even lie about it. Oh, I need a new iron. My cat has this thing about chewing on the cord!! My poor purple iron is suffering badly from hard water deposits, I'd love a new orange one to take its place! I am actually saving up for this iron right now so ... pick me, pick me! This is so happy! It would definitely cut down on the ironing-related grumbling... :) Happy birthday, and thanks for the chance to win! Beautiful iron! (the spitting/leaking comment actually had me laughing out loud!) Happy Birthday! I would love an iron that doesn't spit or leak!!!! All mine end up doing each of those! Ooohh. I could use a new iron! My iron is foul-tempered... a spitter, for sure! I'd definitely make up excuses to USE the iron if I owned one of these orange beauties! I have started sewing more and would love to win an iron. I have a great one but not that awesome color. Mine just broke a couple days ago, right in the middle of a project. ARG! This would be fate if I won. YEAH! Ohhhh this would be the BEST Katy's-birthday present ever! My cheap iron that we bought with wedding money 11 years ago is starting to leave rust marks! I know. Not acceptable. I would love to know what a GOOD iron looks like. Fun giveaways..thanks for including me in your birthday celebration! 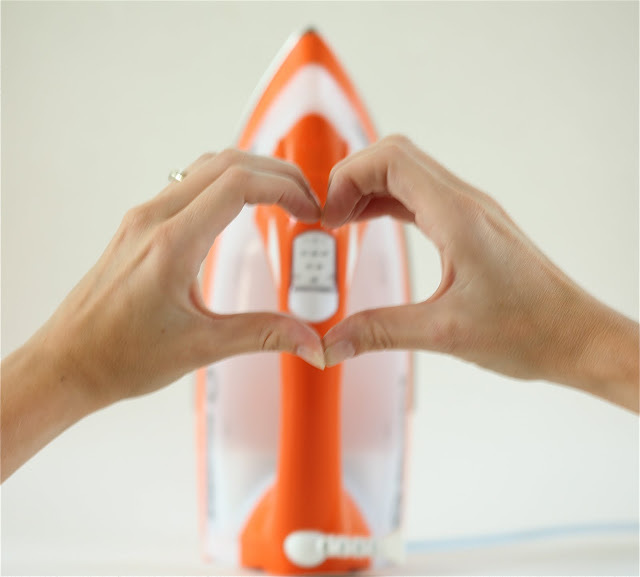 I do love your orange iron, too! Oooooh, pretty :) Happy birthday! and thank you for the chance to win! I have been dreaming of a new iron. I would love to win this one! 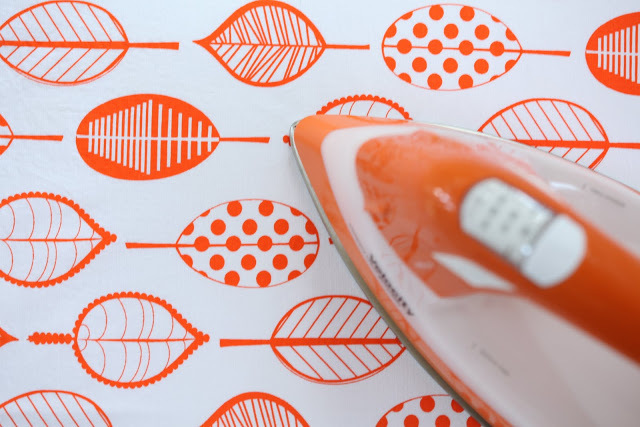 I love a good iron...and you can't beat orange! thanks for the giveaway. Happy Birthday!!! Happy Birthday! I just love that quilt! I totally just got my iron super dirty/weirdly sticky. So this would be perfect! I don't like to iron, but with this one it might be fun? in love with this orange beaut! I could use a good iron! And in such a fun color! my current iron stinks. I need a real sewing iron. Love the orange! Wow I'd love a new iron! My life has come to that when I get excited about the prospects of getting a new iron! Anyhoo I have 8 baby quilts I need to see up in the next few months and this would sure come in handy! Thanks for the chance. Never seen a pretty iron before! But this one definitely is! Oh, I don't like my iron. And I realized it's sitting next to my laptop right now on my desk, and I probably hurt it's feelings...but really, when you have a 15 month old, you do have enough spitting and water messes for one household! No need for an iron to do it too. Thanks for the giveaway and Happy Birthday! I would love to win!!! What a fun iron! Happy Birthday! What a cute iron! It's funny -- I NEVER iron unless I'm sewing, so when my three-year-old son saw my mom ironing something, he asked "you sewing, Gwamma JoJo?" Anyway, happy birthday!!! Oh, I definitely need a new iron. Mine is okay, but definitely not that great. Yes, please! My birthday was on July 25th and I was thinking I would buy myself an iron. Sad but necessary! What a fun splash of color! I do like that orange! I have been searching for an iron that doesn't leak or spit. If this is all you say it is I would happily buy one if I don't win. I'm that odd person who loves to iron but I hate puddles on whatever I'm ironing! The color of this one is Fab. Is it bad to admit that my ironing is still better than my sewing?! I could use a new iron! I'd love this! I have been looking for a new iron and this looks perfect! I love when appliances are bright and cheery! Who'd have thought an iron could look fun! Yes, we all know ironing is almost as important as sewing that straight line.. love it! I think orange and yellow are such friendly colors. 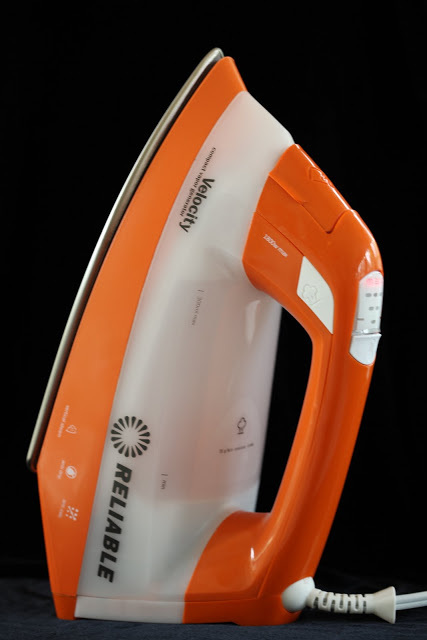 An orange iron would make ironing a much happier chore. Thank you for the chance. This would make me happy to have to iron! Love it! i never win these, but i keep trying? I've always been jealous of your iron, to be honest.